made to deliver 50 milliwatts into that load. The method of using the output power meter can be seen from an inspection of the engraved scales- Full-scale deflection of meter corresponds to 50 milliwatts for a multiplier setting of " 1"
the fact that its resistance was limited to a single value: 4000 ohms at first. Later output meters for 8000 and for 20,000 ohms were made available. 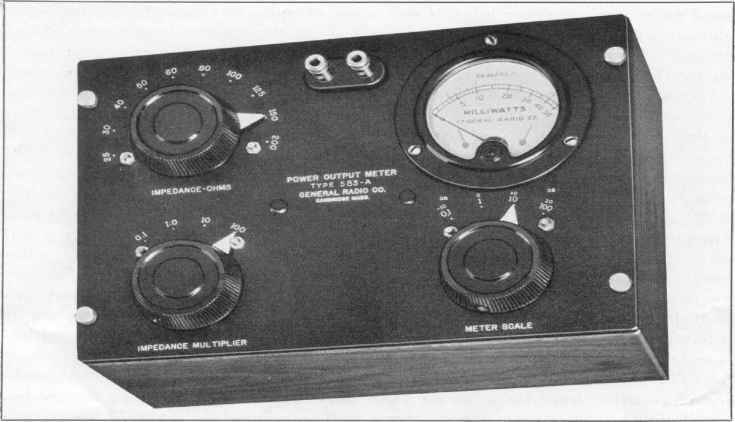 Now, General Radio has developed an output meter of radically new design, in which the load resistance can be adjusted to cover a wide range, with the indicating element direct reading in milliwatts. Figure 1 shows the new Type 583-A Output Power Meter. At the left are the two switches whose settings determine the resistance presented to a circuit connected across the two input terminals. The upper switch permits the selection of ten values which are approximately equally spaced on a logarithmic scale; the lower switch is an impedance multiplier. Hence, the impedance range of the instrument is from 2.5 ohms to 20,000 ohms. 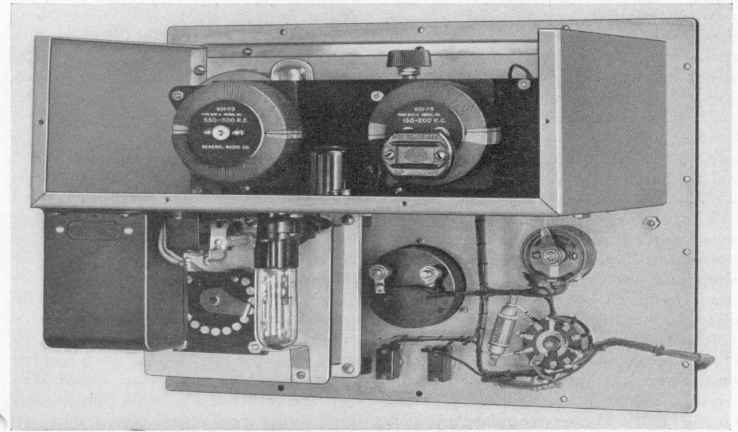 At the right of the panel is a copper-oxide-rectifier voltmeter calibrated in milliwatts. Below it is the meter multiplier, which, when adjusted, makes the full-scale reading of the meter take successive values of 5, 50, 500, and 5000 milliwatts, respectively. Schematic circuit diagram for the Type 583-A Output Power Meter based on a zero reference level of one milliwatt. Readings may be expressed in terms of any other reference level by adding the proper correction term. The principal application of this instrument will, of course, be in the test ing of radio receivers. It will not only 'v serve in the standard selectivity, sensitivity, band-width, and fidelity tests, but it can also be used for measuring with fair accuracy the output of the receiver for different frequencies when once the impedance characteristic of the speaker is known. The output power meter is also useful for determining directly the output power characteristic of any circuit as a function of load impedance. It is useful when making measurements on oscillators, amplifiers, transformers, etc. Conversely, the internal output impedance of the circuit under test can be measured by determining the load impedance for which maximum power output is secured. Other uses w ill probably suggest themselves to the reader. The price of the Type 583-A Output Power Meter is $85.00.